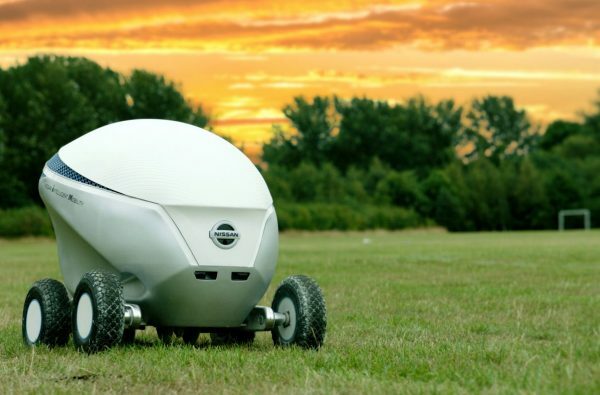 Nissan has been sponsoring the Champions League for a number of years now so to promote their connection of smart cars and grassroots football PitchR was created! PitchR is capable of autonomously drawing football pitches anywhere in the world! The fully custom built rover uses its on board GPS to precisely paint a football pitch of any configuration. While the aircraft grade machined aluminium chassis and motors enabled PitchR to step over the lines it had painted. Our friends at Unit9 commissioned us to design and develop the physical rover while they developed the intelligent software. Fitting such a complex and intricate drive system into the sleek chassis required creating an innovative new drive platform. Entirely machined from billet aircraft grade aluminium, each wheel & leg was independently controllable to enable PitchR to step over painted lines, adjust its weight balance and turn on the spot making PitchR an incredibly versatile robot. Once we had developed the chassis we had to install a dual paint system and the clever electronics to control the robot. Finally the bodywork was entirely 3D printed and finished to the high Nissan concept car standard. The results were incredible. In just 3 months of design, development and testing PitchR was painting football pitches. This is just the beginning of the Nissan Football Lab and we are excited to see where PitchR goes next!